No one can deny the existence of technology in today’s world. Everywhere you look, people are talking on cell phones or toting laptop bags. Coffee shops are filled with people using wireless Internet and kids can barely complete a sentence without checking their cell phones for an incoming text message. Technology is part of everyday life. So how can schools use technology in the classroom to their advantage? According to the YouTube video, “Did You Know?,” teachers today are “preparing students for jobs that don’t exist, using technologies that haven’t been invented, in order to solve problems we don’t even know are problems yet.” Therefore it’s critical that teachers find a way to incorporate modern technology into the classroom setting and classroom design. Science teacher Melinda Berger of Maryland says that her middle school uses tech-friendly school furniture, including two laptop carts, and the high school students own their own laptops. Middle school students are creating electronic portfolios to showcase some of their best work. 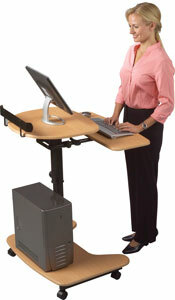 Science teacher MaryLee Wesberry of Tennessee states that laptop carts and an “e-classroom” are available to teachers. She uses a new biology textbook with an online and interactive component in her classroom. Biology teacher Debbie Wheeler from Kentucky says more than half the students at her school use their own laptops in class. She and her teaching partner revised their curriculum to include a more interactive lab model. These teachers and others have discovered that computers and the Internet can be used as primary teaching tools, rather than just as support tools to other teaching methods. By planning their classroom design accordingly and incorporating the right tech-friendly school furniture, teachers can combine these tools with other technologies such as digital cameras, scanners, video cameras, and projectors, teachers can get students involved in exciting projects that will both hold their attention and help them learn.